When software systems are delivered too late, when they fail to meet the needs of their users, when only a fraction of their capacity is used, when their maintenance costs more than their development, when changes are impossible — then there is a frantic search for new and better engineering techniques and tools. Dahlbom and Mathiassen advocate a different approach to these problems: pausing and reflecting. 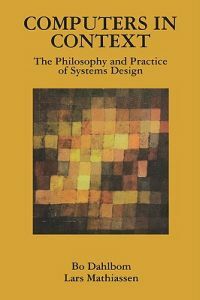 Surprisingly little time in the education of systems developers is devoted to a consideration of the methods, goals and politics of computerization. The of the book is an examination of the notion of quality itself. The effective computer professional must arrive at his or her own sense of what quality can and should mean in a particular situation in order to resolve the inevitable creative tensions between the nature of people and that of computers, between structured systems and the process of change. The authors draw on a rich range of literature from philosophy, organizational theory, and technology and social change to support their points. But, adducing many real-life examples, they avoid jargon and presuppose no formal background. Computers in Context will hep students, computer professionals, and managers alike understand better what it is they are trying to do with computer systems, how and why.